Marc Marquez insisted he was not the Lionel Messi of motorsport, saying there was no comparing to the Barcelona star. 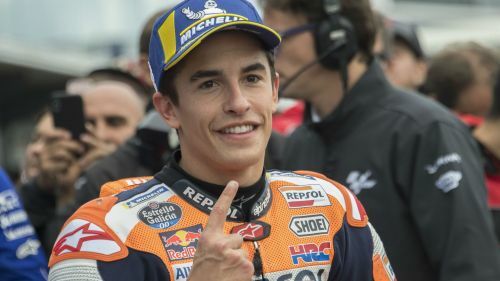 The Repsol Honda rider, 26, is already a five-time MotoGP champion, closing in on Giacomo Agostini's record of eight premier-class titles. But Marquez was unwilling to be drawn into comparisons to Messi, who has won an equal record five Ballons d'Or during an incredible career. "It would be a huge mistake, I'd jump from a cliff if I was compared to Messi," he told DAZN. "Messi is Messi, he is one of my idols overall, because of the things he does on the field. But also because of how he is. "I met him three or four times and each time he came to speak to me, he greeted me. "I drive motorbikes, but when Messi comes and behaves as someone else, it's something that I really respect and it's really valuable to me." Contento de formar parte de esta familia. @DAZN_ES ya es una realidad! Happy to be part of this family. @DAZN_ES it’s already a reality! Marquez will be aiming for his sixth title in seven years when the MotoGP season begins in Qatar on March 10. The Spaniard admitted his preparation for the campaign had been impacted after undergoing shoulder surgery at the start of December. "My feelings are the same every year. It's true the pre-season was different because of my shoulder injury," Marquez said. "Maybe I couldn't prepare like I would have in previous years, but I am almost back to 100 per cent. And I think I'll be 100 per cent very soon. "It will be the most important thing that I feel better, and mentally I will face it for one more season, where I will fight for the title. "I will try and defend the title and make things difficult for Jorge Lorenzo and the other rivals."